When we first viewed the house wh ere we now live, it felt right as soon as we stepped in at the front door. After checking out the living-room and kitchen, we climbed a flight of stairs to the middle floor and another to the top, where two bedrooms were built into the roof space. As I looked out of one of the narrow windows next to the sloping ceiling, across the neighbours’ back gardens to the green and blue stripes of fields and sky beyond and above, I suddenly felt tears prickling the back of my eyes. That’s when I knew for sure that this was the house I wanted us to buy. 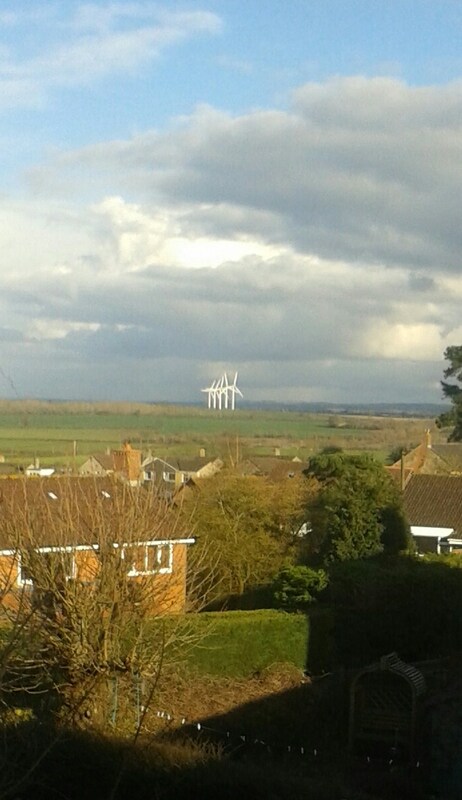 Since then, a line of five wind turbines has been planted in one of those fields, right on the horizon. Luckily for me, I’m one of the few people who think they’re beautiful, not an eyesore. Perfectly framed in the top floor window, they catch the light each morning, glowing white against the sky. Through the same high window, I can often spy on a pigeon or crow perched shakily at the end of the neighbour’s rooftop TV aerial, flapping its tail feathers to keep its balance. Each month, on a cloudless night, the full moon shines through, and every other month the window offers a perfect view of the International Space Station gliding across the sky at the end of its journey from west to east. I do like windows. I even like paintings with windows in them – a frame within a frame. Especially from high up, looking out and across, there’s a sense of having an expansive view of the world outside. And yet… as I stand in front of our top-floor window, I’m aware that the sounds outside – the rumble of passing traffic, the barking of a small dog, the squawks from the car park rookery – are muffled. I notice the hedges and tree-tops shivering in the breeze but I don’t feel the wind on my face. I see grey-bottomed clouds but I can’t smell the rain in the air. The pane of glass that gives me access to the world outside also detaches me from it. I’m sure it does you good to escape to the top floor sometimes and spend a few minutes staring out of a window. It clears your head and helps you to chill out in the middle of a busy day. But it’s also great to be involved in the world at ground level – and for that, a window isn’t good enough. You have to get out of the door. This entry was posted in Uncategorized and tagged contemplation, doors, windows. Bookmark the permalink.